Social media has taken the web by storm, and is now increasingly being integrated with various services. Social recommendations have now become a lot more important then they were a few years ago as compared to organic search, which goes on to show that the way the average internet surfs is changing. And it's no wonder that every social network wants you to share its content all over the web. For that effect, Facebook, following into the footsteps of YouTube and Twitter, has launched embeddable posts, which will enable blogs and websites to share status updates, pictures and videos that are on Facebook. Wow new feature of Facebook is really cool.. It's a nice feature but I fear, why people will embed their facebook post in their blog? Facebook likebox is enough for showing the important discussions. This is great and a step ahead for a better service and good delivery. I like this. thanks for providing a great information to us. Will facebook enable The "Embed" Option for all the pages ? 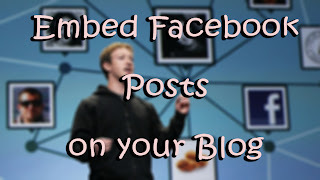 Truly great post about embedding Facebook posts. But, I have a question. Can I use it on my WordPress blog? The second option where we can manually get the code is not available. Excellent post and very helpful for my WordPress Projects. It’s amazing in support of me to truly have a blog site, which will be valuable meant for my knowledge. Thanks admin.. The reference to entity "appId" must end with the ';' delimiter.